Boardwalk Quilt & More Coming Soon. . . I know it’s been awhile since I’ve posted. It’s been a lot going on in my world, which of course is no excuse. BUT, if it’s any consolation, I have some really exciting things coming up here soon. Look for the first post on the 5th of April (So, it looks like we’ll be launching sometime in May. Stay posted!). In the meantime, I took a few pictures of my latest quilt creation this weekend. It is a quilt that I made as a throw for my bedroom. It is called “Boardwalk”. I had a hard time naming it but, my friend Chris suggested “Boardwalk and I thought it was perfect. The long vertical stripes do put you in mind of a boardwalk. 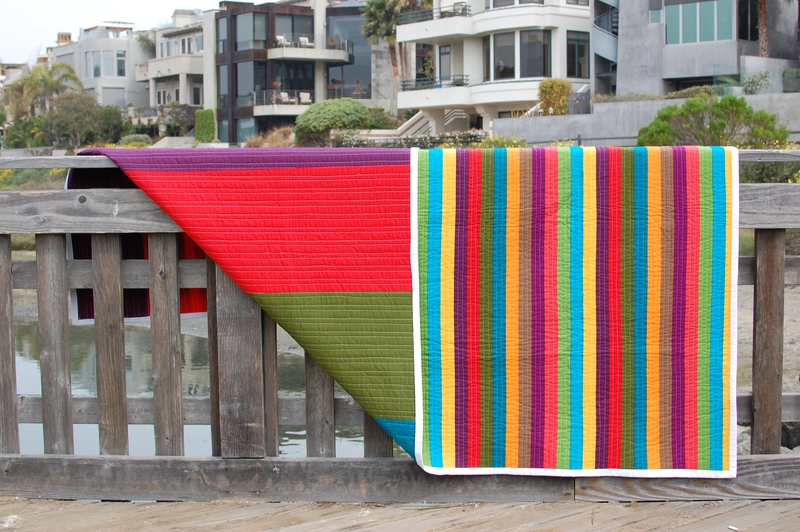 I love the colors and the vibrancy of this quilt. I debated over the white binding and even took it to the LA Modern Quilt Guild meeting to get everyone’s vote. I got lots of great advice but in the end they encouraged me to be daring and go with the white. I’m so happy I did. It wasn’t until the binding was completely sewn on that I knew I had made the right decision. I did have a challenge with the mitered corners for a 1″ binding (finished width). Maybe I’ll add a quick tutorial on this because I love the effect of the 1″ binding. I’ll post more pictures soon. I am in love with the gorgeous colors and the simple clean design of this. Boardwalk is a good name for it! That is a gorgeous quilt, and the white binding is perfect. I just love it! Oh, I really LOVE this. So pretty. Oh my goodness, this quilt is beautiful. I love it. Oh! 1 inch binding is so on my want to do list of things to do …. Please do a tut! Seriously, one look at this quilt and I feel completely excited for summer. What a fabulous color POW. Thanks for sharing it! Thanks again for bringing this breath of fresh air into the world! Becky, I’m so glad you like it! About the binding. I machine sew it to the front and I hand sew it to the back. Ah, thanks! I actually meant to say “I like to do everything by machine..” above. But to get such a great result, I may have to do a little hand sewing. Stunning! And yes, definitely awesome decision on the white binding! I should probably wait until the tutorial, but is this a continuous mitred binding? Or do you do each side individually? Thanks Cheryl! And, yes it is a continuous mitered binding. I’ll post the tutorial soon. Latifah it’s seriously so so so great! I love it. The white binding is perfect. This is a beautiful quilt. And the somewhat wide white binding really does make it even more amazing! Well done. I’m glad you went with the white binding! It is soooooo awesome! Leslie, I too was skeptical until it was completed. 🙂 But, I thought the contrast would be awesome. I figured, worse comes to worse, I could take it off! Haha! Stunning quilt! What solid fabrics do you use? Thanks! So far I’ve only used Kona Solids but, I’m looking at getting some other types to work wtih. I LOVE working with solids! Thanks so much Ashley! I’m so glad that you like it. Ummmm….. so can I have it? I need it! Lol, JK I just really like it. Thanks for sharing. Beautiful quilt and the colors are fabulous and the white border really sets it off. Thanks for sharing. 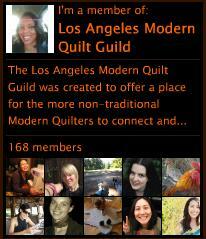 I saw that your quilt made it to the pages of one of the national quilting publications; CONGRATULATIONS!!!! Thanks Laurel. So much fun! 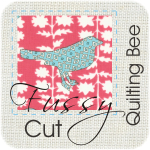 I Dream of Quilts · A blog of my quilting journey!